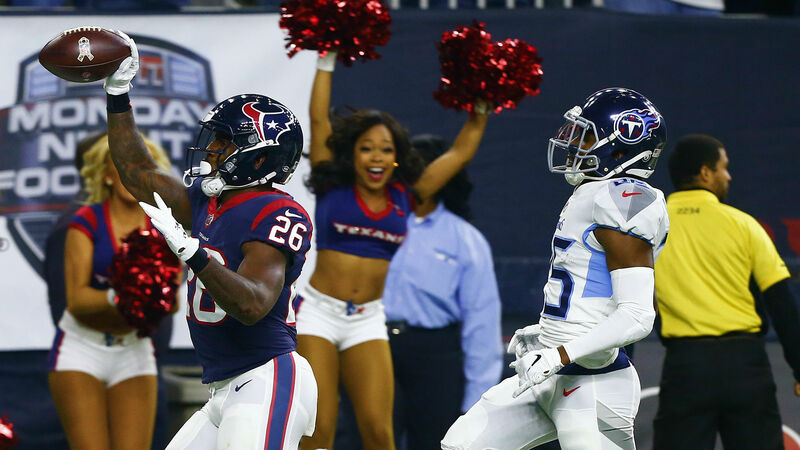 The Texans won their eighth straight game after beating the Titans 34-17 on Monday night. Houston improved to 8-3 and now has a comfortable lead in the AFC South. Lamar Miller was the star of the night for the Texans with 162 rushing yards, including a 97-yard touchdown run in the second quarter. Deshaun Watson was as efficient as ever, completing 19 pf his 24 throws for 210 yards and two touchdowns. He also rushed for 70 yards and one touchdown. The Titans fell to 5-6 and are among the several teams caught in the logjam that is the AFC playoff race. Sporting News provided live updates and highlights from Houston’s eighth consecutive victory. 11:03 p.m.: FUMBLE TITANS. Henry fumbles with 19 seconds left and Houston’s Aaron Colvin recovers. Texans run out the clock and win their eighth straight. 11:01 p.m.: The Titans get the ball back with over 90 seconds to go, but it looks like it’s too little, too late for Tennessee. 10:56 p.m.: Houston’s moving the ball and milking the clock. It has the ball at the 2-minute warning at the Tennessee 31-yard line. 10:49 p.m.: Tennessee goes three-and-out and gives the ball back to Houston with 6:43 left in the game. Time’s running out for the Titans. 10:43 p.m.: TOUCHDOWN TEXANS. Two plays after the review, Watson finds Thomas for another touchdown, this time from 10 yards out. Texans lead 34-17. 10:42 p.m.: After review, the ruling on the field stands. Texans with the ball now at the Tennessee 10-yard line. 10:38 p.m.: Watson scrambles for a huge gain of 34 yards, but the ball came loose as he was tackled. The officials called him down, but the Titans are challenging the ruling on the field. 10:32 p.m.: Watt forces a fumble by Mariota on third down, but Dion Lewis recovers it for Tennessee. They’ll punt it away and Houston will take over at its own 40-yard line. 10:31 p.m.: The Titans force a punt at the start of the fourth quarter and will get the ball back to try and make it a one-score game. 10:22 p.m.: TOUCHDOWN TITANS. Mariota hits Davis for a 48-yard touchdown to give the Titans their first points since the first quarter. Texans lead 27-17. 10:12 p.m.: Tennessee offensive lineman Taylor Lewan’s down with an injury and is escorted to the sideline. He’s being tended to by trainers. 10:01 p.m.: FIELD GOAL TEXANS. Fairbairn drills one from 48 yards out to extend the lead. Texans lead 27-10. 9:58 p.m.: Houston converts on a fourth-and-2 as Watson finds Hopkins on an out route. 9:54 p.m.: Watson connects with Ryan Griffin early in the third quarter for a gain of 22 yards. 9:39 p.m.: FIELD GOAL TEXANS. A ridiculous catch by Hopkins sets up for Ka’imi Fairbairn to knock down the 43-yard field goal. Texans lead 24-10. [email protected] keeps making these ridiculous sideline catches ? 9:32 p.m.: JJ Watt knocks Mariota over and Covington finishes the job with his second sack on the night. Third-and-29 coming up for the Titans. 9:30 p.m.: After a punt by Houston, the Titans get the ball back with 1:48 left in the half. 9:16 p.m.: Mariota is sacked by Houston’s Christian Covington on third-and-9 for a loss of eight yards. Tennessee punts it away and the Texans will take over at their own 13-yard line. 9:08 p.m.: TOUCHDOWN TEXANS. On the first play of the drive, Watson hands it off to Miller who takes it 97 yards to the house. Texans lead 21-10. 9:05 p.m.: The Titans line up to go for it on fourth-and-1 at the Houston 2-yard line and the Texans’ defense holds. Houston takes over on downs. 8:57 p.m.: On the following drive, Derrick Henry takes the direct snap and then flips it to Davis who runs the end around for a 39-yard gain. 8:53 p.m.: TOUCHDOWN TEXANS. Watson runs one in on a keeper from 15 yards out for the touchdown. Texans lead 14-10. 8:49 p.m.: The Texans force a punt by the Titans and the Watson connects with DeAndre Hopkins for a big gain. Texans end the first quarter deep in Tennessee territory. 8:39 p.m.: TOUCHDOWN TEXANS. A couple of big runs by Lamar Miller set up a 12-yard touchdown from Watson to Demaryius Thomas. Titans lead 10-7. 8:34 p.m.: The Texans fumble on the ensuing kickoff, but they recover near their own 40-yard line. 8:30 p.m.: TOUCHDOWN TITANS. Jonnu Smith takes a short pass from Mariota 61-yards to the house. Titans lead 10-0. JONNU [email protected]_81 takes the short pass 61 yards for the #TitanUp TD! 8:25 p.m.: The Texans face a third-and-2 early and Deshaun Watson is sacked by Tennessee’s Jayon Brown for a loss of 11 yards. Houston will punt it away. 8:21 p.m.: FIELD GOAL TITANS. Ryan Succop converts a 31-yard field goal to put Tennessee out in front early. Titans lead 3-0. 8:18 p.m.: Marcus Mariota finds Corey Davis for a 19-yard gain. Then on the ensuing play, Houston’s Justin Reid is flagged for defensive pass interference. 8:17 p.m.: Houston wins the toss and defers. Titans start with the ball on their own 25-yard line.